IMCDb.org: 1959 GMC F-Series 'Crackerbox' in "Route 66, 1960-1964"
Quote First, the GMC aluminum cabover, commonly called the 'Crackerbox', came out in 1959. There were 2 versions, the DFR 8000 and the DLR 8000. The prefix reads like this- D is diesel engine, F is cabover with set forward front axle, L is cabover with set back front axle, and R is for air suspension. The DFR came with the 6V-71 engine, the DLR had the 6-71. 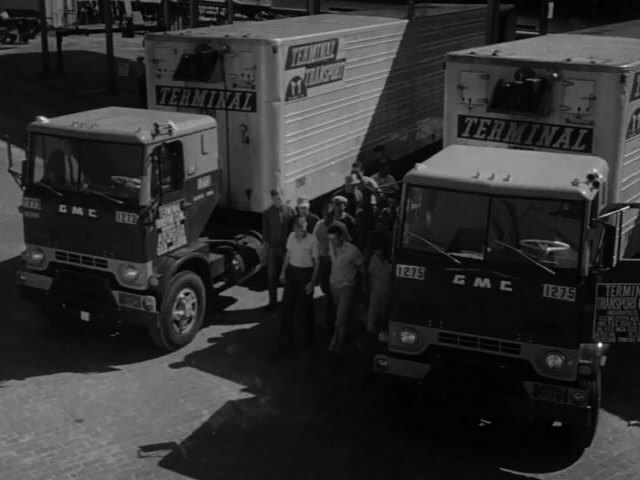 These trucks were the most advanced highway tractors available in '59. They had a welded fabricated chassis, aluminum cab, and independent front air suspension. In 1960, 2 new models joined the aluminum cabover line, the DF 7000 and tandem rear axle DFW 7000. These trucks were in effect simplified DFR models. They both featured the 6V-71, had set forward front axles, steel spring suspension, and a riveted C-channel frame. These new models were less expensive than the air-suspension models, and were more popular. In 1961, 2 more models were added, the DF 7100 and DFW 7100. These trucks were identical to the DF/DFW 7000's, except they had the new 8V-71 engine. In 1962, the DFR and DLR 8000's were dropped, and the DFI 7000 and DFWI 7000 were added. These trucks were also identical to the DF/DFW 7000's, but they featured the 6-71 engine. From 1962 to 1965, the aluminum cabover line offered those 6 models, the DF 7000, DFW 7000, DF 7100, DFW 7100, DFI 7000, and DFWI 7000. As far as I have been able to figure out, none of these aluminum cabovers offered any gasoline engines, including the 702 V-12. There was some promotional material that showed drawings of an aluminum cabover with the gas V-12, but such a truck is not listed in any sales brochure, service manual, or parts book. I have never seen such a truck, either in person or a photograph. However, the 702 V-12 was offered in the steel tilt cab L 7000 and tandem axle LW 7000 from 1960 to 1965. In 1966, the V-12 was dropped and replaced with the 637 gas V-8. This new engine was basically a 478 V-6 with 2 more cylinders added. It produced about the same power that the V-12 did, but was lighter and much shorter. The gas 637 was offered in the aluminum cabover models FE 9500 and tandem axle DE 9500 until 1968. The best resource for identifying what GMC offered these years is the book 'GMC Heavy Trucks 1927-1987' by James K. Wagner. As it was not always sold with a Diesel engine, the D should not be used, I think. F-model seems to be used by fan sites, but it would be certainly better to identify it as a F-Series, to avoid it to be confused with the other (non tilt-cab) GMC COE F-Models.